The ambience at the restaurant is warm and inviting, artwork and photographs line the storied walls, red fringed lamp shades cast a warm hue to the room, tables are dressed in pristine ivory linens and miniature silver samovars. 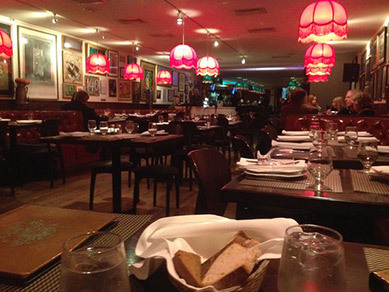 Tufted dark red leather banquettes line the walls and bentwood chairs with red leather seats flank the tables. Friend and partner, the Nobel Award Winning poet Joseph Brodsky's photograph holds a place of honor and lucky patrons can request to dine at the Brodsky table, and friend and partner, the legendary dancer Mikhail Baryshnikov's white baby grand holds center court where it is played each evening. The restaurant's menu is a delight of traditional Russian food including Pirozhok - Russia's classic country pastry filled with various savory fillings, Vareniki - traditional Russian dumplings filled with a variety of savory and sweet fillings, Kulebyaka - salmon filet, garden vegetables, and herbs stuffed in a delectable puff pastry, Chicken Kiev - the restaurant's famous dish of succulent tender chicken breast stuffed with herbed butter, lightly breaded and baked and served with creamy mashed potatoes, Seafood Blinchiki - baby shrimp and scallops wrapped in blini, served with a light saffron sauce and garnished with red caviar, and Beef Stroganoff - Russia's classic dish of lean tenderloin and sautéed mushrooms in a mushroom cream sauce, served over egg noodles, mashed potatoes, or kasha, to name but afew. Chef Lidija Ragauskas took time out of her day to speak with Luxury Experience about her culinary background and about the Russian Samovar where she has worked for the past 18 years. She learned her trade by attending a culinary school in Estonia, USSR, and honed her skills working in the USSR before coming to the United States. Commanding the kitchen at Russian Samovar Restaurant and Piano Bar, she said that two of her favorite items on the menu are the Lamb Chops, which are savory lamb shanks simmered in a red wine reduction with herbs and peppers and served over kasha, and the Beef Stroganoff. With an eye on the seasons, the restaurant has seasonal soups on the menu - for summer, there is Summer Borscht, a cold refreshing beet soup, Okroshka with a choice of kvas or kefir, and Chilled Cucumber and Dill Soup, and for winter - Solyanka, a traditional hearty "peasant" soup made with beef, smoked sausages, olives, pickles, and onions. The restaurant also has banquet menus for holiday events and for New Year celebrations. A few of the specialty items on the menu include suckling pig, rabbit, and beef and salmon tartar. When asked what her favorite ingredient is, she replied "dill." The best advice she ever received from another chef? "Get more sleep when you can. "Although chefs have little free time, when she is not busy working in the kitchen at Russian Samovar she likes to go to the theatre. With the restaurant's location in the heart of the theatre district, she has plenty to choose from. Chef Lidija Ragauskas graciously shares her mouth-watering recipe for Beef Stroganoff to tempt your palate into visiting the restaurant. Method: With nutmeg on the tip of a knife, slice the beef into strips. In a large skillet, quickly brown the beef on both sides in the olive oil. Remove the steak from the pan. Add the onion slices and mushrooms to the pan drippings. Sauté for a few minutes, until the onion is tender. Put the beef back in the pan with the onion and the mushrooms. Add the mustard and cognac and cook over low heat for about 30 minutes, covered. Adjust seasoning to taste, adding salt and pepper as needed. Stir in the sour cream and heavy cream the last few minutes, right before you serve the Beef Stroganoff. 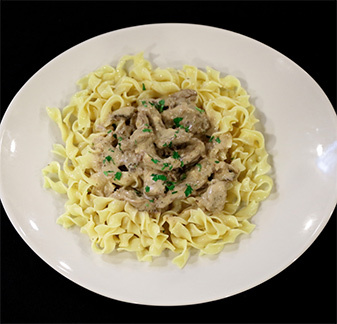 The restaurant serves their Beef Stroganoff over egg noodles, mashed potatoes, or kasha. The restaurant is open Monday from 5:00 pm until 2:00 am, Tuesday through Thursday from 12:00 pm until 2:00 am, Friday and Saturday from 12:00 pm until 4:00 am, and Sunday from 12:00 pm until 2:00 am. 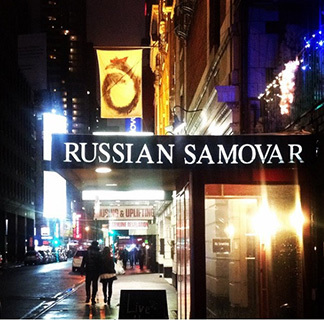 Read about our dining experience at Russian Samovar in the Restaurants section.